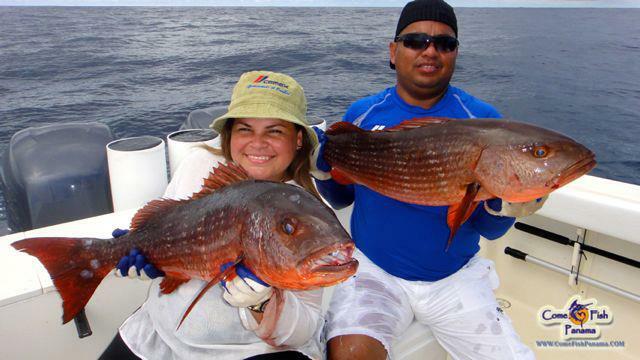 Fishing with us this week were returning husband and wife anglers Junior and Nitzia as well as first-time Come Fish Panama anglers Rene, Eric and Veru. On our way offshore, we were rewarded with a magnificent Pacific Ocean sunrise and calm 1-2 foot swells. Wind and sea conditions remained calm throughout the day. 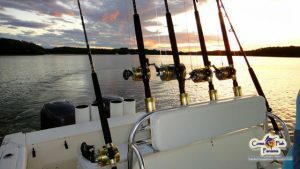 It feels as though Panama’s summer season is just around the corner so to speak, when we typically enjoy fabulous fishing and calm conditions. Once we spotted the porpoises, we eased the boat near the school thinking and hoping that the Yellowfin would be lurking just below or alongside them. We threw out a live Blue Runner to see if the bite was on, and nothing. We caught up to the school once again, moved in front of them, and tossed out the Blue Runner once again. Nothing! Trying to make something happen for this group, we decided to drop a few jigs down deep to see if the Tuna were holding deeper, but that didn’t trigger a bite either. On to the bottom feeders for some action! I have to say that this group including Rene, Eric, and Junior were dialed in with the snapper bite. They hooked up with dead bait, live bait, jigs and even by throwing a Wombat popper made by OTI just before moving on to other species. Veru and Nitzia also got in on the action and ended up catching a beautiful Mullet Snapper on live bait. By the end of the bite at “Snapper Lane”, this group of anglers hooked up and released over 25 Mullet Snapper, Cubera Snapper and Rock Snapper. We decided to move to a spot where we usually find Amberjack holding, but today must have been their day off. So, no AJs for this Snapper group, but certainly some sore arms from the previous battle. other species would generate enough fish stories until their next trip.